What this haul lacks in quantity is made up for in quality. 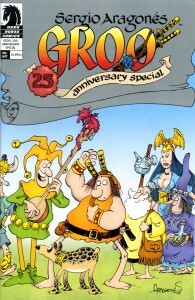 Groo 25th Anniversary special: I never had a chance to read much Groo since most of my early comics came from the local Lawson’s convenience stores. But there has never been a Groo story that failed to make me laugh and this special continues that tradition. It kicks off with two pages of Sergio and Mark intro magic which lead into the main story called “the PLAGUE.” Groo and Rufferto meet up with the Sage in a village that seems to be in the grips of a cold. Once the Sage figures out what’s causing all of the sneezing, the crew embarks on a quest where they (and the home audience) find out that the village the disease isn’t the only problem in the village. In fact, it may be my favorite story of the year, period. Seriously. It even has monkeys in it, so that’s extra points right there. Mark Evanier takes some time to debunk some ‘urban legends’ about Groo and the staff. We get a tale from Groo’s youth and the special is capped off with the Groo Alphabet. It’s $5.99 and worth every penny of it as it’s good for multiple reads. Gumby #3… cannot be explained. 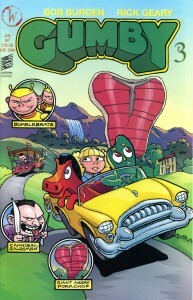 It starts where issue #2 ended with Gumby’s parents still thinking that their son is a sack of potatoes due to the hypnotic spell of the evil Carnies from who Gumby defeated with ghostly assistance from the Man in Black. From that point it just gets weird. How weird? For one, you get the Bumble Brats, a gang of naughty little kids in matching bee suits. What they do in the first few pages of the comics get them instant “You wrong!” status, but they’re not as bad as, say, Block-heads. With his parents still in zoned-out mode, Gumby has to be the man of the house. Once he answers a call from a telemarketer who claims that he’s won a prize, the whole situation rolls into something a story that I’d ruin for you if I recapped it. The magic of this book is how it makes your brain tingle due to it’s weirdness. Just expect vehicular mayhem, zodiac creature spirits, time share salesmen with appropriate names and the true, unbridled power of Mr. Oppenheimer. And for fans of current, typical comics, there’s even a dead girlfriend in the story. There’s something in this book for everybody! Thanks to Team Groo (Sergio Aragones, Mark Evanier, Tom Luth and Stan Sakai) and Team Gumby (Bob Burden, Rick Geary and Steve Oliff) for bringing the laughs after a tough week.